"Combat Sports" redirects here, for The Vaccines' album, see Combat Sports (album). Tradition styles of wrestling exist in most cultures; wrestling can be considered a cultural universal. Boxing contests date back to ancient Sumer in the 3rd millennium BCE and ancient Egypt circa 1350 BCE. The ancient Olympic Games included several combat-related sports: armored foot races, boxing, wrestling, and pankration, which was introduced in the Olympic Games of 648 BCE. In ancient China, combat sport appeared in the form of lei tai. It was a no-holds barred combat sport that combined boxing and wrestling. There is evidence of similar combat sports in ancient Egypt, India and Japan. Through the Middle ages and Renaissance, the tournament was popular. Tournaments were competitions that featured several mock combat events, with jousting as a main event. While the tournament was popular among aristocrats, combat sports were practiced by all levels of society. The German school of late medieval martial arts distinguished sportive combat (schimpf) from serious combat (ernst). In the German Renaissance, sportive combat competitions were known as Fechtschulen, corresponding to the Prize Playing in Tudor England. Out of these Prize Playing events developed the English boxing (or prizefighting) of the 18th century, which evolved into modern boxing with the introduction of the Marquess of Queensberry rules in 1867. Amateur boxing has been part of the modern Olympic Games since their introduction in 1904. Professional boxing became popular in the United States in the 1920s and experienced a "golden age" after World War II. The creation of Brazilian Jiu-Jitsu is attributed to the Gracie family of Brazil in 1925 after Asian martial arts were introduced to Brazil. Vale-tudo, wrestling, muay thai kickboxing and luta livre gained popularity. Modern Muay Thai was developed in the 1920s to 1930s. Sambo was introduced in the Soviet Union. Modern Taekwondo also emerged after the Japanese occupation of Korea and became an Olympic sport in 2000. Sanshou as part of modern wushu was developed in the People's Republic of China since the 1950s. Kickboxing and full contact karate were developed in the 1960s and became popular in Japan and the West during the 1980s and 1990s. Modern Mixed Martial Arts developed out of the interconnected subcultures of Brazilian Jiu-Jitsu and shoot wrestling. It was introduced in Japan in the form of Shooto in 1985, and in the United States as Ultimate Fighting Championship (UFC) in 1993. The Unified Rules of Mixed Martial Arts were introduced in 2000, and the sport experienced peak popularity in the 2000s. During this period, multiple brands and promotions were established. The most well-known promotion for MMA is UFC. 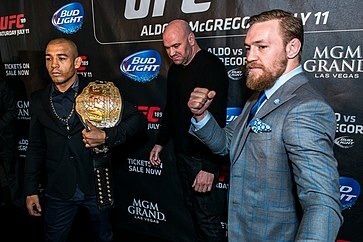 A photo of Conor McGregor, Jose Aldo, and Dana White at a press conference for the fight between McGregor and Aldo. This shows the two fighters posing for media, increasing revenue and interest in the fight. Combat sports are generally more popular among men, both as athletes and as spectators. For many years, participation in combat sports was practically exclusive to men; USA Boxing had a ban on women's boxing until 1993. A study conducted by Greenwell, Hancock, Simmons and Thorn in 2015 revealed that combat sports had a largely male audience. Combat sport promotions such as UFC or Bellator MMA are generally advertised to men. Combat athletes usually fight one-on-one. Different sports involve different skill sets and moves. For example, boxing only allows punches, taekwondo largely involves kicks, and both Muay Thai and Burmese boxing allow the use of elbows and knees. There are also combat sports based on grappling, such as both freestyle and Collegiate wrestling. Modern MMA is similar to the ancient Greek Olympic sport of pankration; Both allow a wide range of both striking and grappling techniques. Some combat sports involve the use of weapons and armor, such as fencing, kendo, and the new sport SCA Heavy Combat; In Gatka and Modern Arnis, sticks are used. Shoot boxing Japanese combat sport introduced in 1985. Pankration (Ancient Greek Freestyle Fighting). Dambe traditional form of boxing, including kicking and wrestling elements, practiced by the Hausa people. Combat Sambo: Russian sport introduced in the 1920s. Vale Tudo (No Rules Freestyle Fighting), derived from Brazilian circus shows of the 1920s. Sanshou (Sanda) (Chinese kickboxing within Contemporary Wushu, includes some grappling techniques), institutionalized as part of modern Wushu since the 1950s. Shoot-style wrestling, since the 1980s. Mixed Martial Arts (Freestyle Fighting), since the 1990s. The techniques used can be categorized into three domains: striking, grappling, and weapon usage, with some hybrid rule-sets combining striking and grappling. In combat sports the use of these various techniques are highly regulated to minimize permanent or severe physical damage to each participant though means of organized officiating by a single or multiple referees that can distribute penalties or interrupt the actions of the competitors during the competition. In weapon based sports, the weapons used are made to be non-lethal by means of modifying the striking portions of the weapon and requiring participants to wear protective clothing/armor. Amateur boxing - (1904 - 2016). Boxing has been staged at every summer Olympic games since 1904 except Stockholm in 1912 due to Swedish law. Judo - (1964, 1972 - 2016). Judo was not included in the 1968 Mexico City summer Olympics. Women's judo was added to the Olympics in 1992 in Barcelona. Taekwondo - 1988 Seoul Games (demonstration sport), 2000 - 2016. Became an official medal sport at the 2000 Sydney Olympic Games. Wrestling (Greco-Roman) - (1908 - 2016). The first form of wrestling to be held at the Olympic Games. Wrestling (Freestyle) - (1920 - 2016). Was modified at the 2000 Sydney Games and reduced the amount of weight categories provided. Pankration and singlestick are two other forms of combat sports that have been included in the Olympics. These combat sports were introduced to the Olympic Games in the early 1900s however singlestick was only represented at the 1904 Olympic games and pankration whilst lasting four centuries in Ancient Greek Olympia's, was not included at all after 1900. Fencing - (1896 - 2016) Competitive fencing is one of the five activities which have been featured in every modern Olympic Games, the other four being athletics, cycling, swimming, and gymnastics. In combat sports, victory is obtained from blows, punches or attacks to the head to a point of physical injury that the opponent is unable to continue. Different forms of combat sport have different rules and regulations into the equipment competitors have to wear. In Amateur boxing seen at the Olympics, competitors are permitted to wear head guards and correctly weighted padded gloves, mouth guards are optional and the canvas floor protection from a hard fall. In sports such as Taekwondo, competitors are permitted to wear a trunk protector, head guard, gloves, groin guard and shin and forearm pads. Professional boxing and UFC are two of the most dangerous combat sports in the world due to the lack of protective gear worn (compared to the protected fists). Competitors in these two sports have the option to wear a mouthguard and must wear suitable gloves. The lack of protective clothing makes competitors vulnerable to concussion and further traumatic head injuries. A scientific experiment, conducted last year by Dr Andrew McIntosh of ACRISP at the Federation University of Australia, tested the impact of 7 different head guards in combat sport. The results of the experiment revealed the benefits of the combination of a glove and headguard in maximising the impact energy attenuation. A study conducted by Lystad showed that combat sports with little to no protective gear such as MMA or boxing has an injury incidence rate range of 85.1-280.7 per 1000 athletes in comparison to another striking combat sport like Taekwondo which has a large amount of protective gear such as pads, headgear, mouth guard and gloves, has an injury incidence rate range of 19.1-138.8 per 1000 athletes. This means that injury rates are drastically lowered when protective gear is used. - A circle which is 27 feet in diameter, of which the inner 24 feet is colored blue. The next 3 feet is yellow, which is the caution area. When the fighter gets to the yellow area, he knows he's getting close to stepping out-of-bounds. The last edge of the ring is the red zone, which features a 30-degree upward angle. When a fighter steps on the red area, he's stepping up slightly, letting him know he's out-of-bounds. - Can be round or have at least six sides. The fenced area is generally called a cage or more precisely, depending on the shape, a hexagon (if it has 6 sides) / an octagon (if it has 8 sides). - Some replace the metal fencing with a net. ^ "Boxing". Encyclopedia Britannica. Retrieved May 12, 2018. ^ Brownell, Susan Elaine (1990). The olympic movement on its way into Chinese culture. University of California, Santa Barbara. pp. 29, 63. In both ancient China and Greece, the most popular sports were probably wrestling, boxing, and combinations thereof (Greek pankration, Chinese leitai). The same might be argued for ancient Egypt, India and Japan. [...] In both ancient China and Greece, the no-holds-barred combat sport (Greek pankration, Chinese leitai) was probably the most popular one. ^ "History of Amateur Boxing". Team USA. Retrieved 2018-03-21. ^ Armstrong, Walter (1890). Wrestling. New York: Frederick A. Stokes Company. p. 77. ^ "Boxing Equipment, History and Rules | Olympic.org". Retrieved 2016-05-17. ^ "Judo Equipment, History and Rules | Olympic.org". Retrieved 2016-05-17. ^ "Taekwondo Equipment, History and Rules | Olympic.org". Retrieved 2016-05-17. ^ "Wrestling Greco Roman Equipment, History and Rules | Olympic.org". Retrieved 2016-05-17. ^ "Wrestling Freestyle Equipment, History and Rules | Olympic.org". Retrieved 2016-05-17. ^ "Combat Sport - 2015". Australian Medical Association. 2015-11-21. Retrieved 2016-05-17. ^ "Boxing Equipment, History and Rules | Olympic.org". www.olympic.org. Retrieved 2016-05-17. ^ "Taekwondo Equipment, History and Rules | Olympic.org". www.olympic.org. Retrieved 2016-05-17. ^ "Sign In". PMID 26192195. ^ Lystad, Reidar (2015). "Epidemiology of injuries in full-contact combat sports". Australasian Epidemiologist. 22. This page was last edited on 15 March 2019, at 19:34 (UTC).